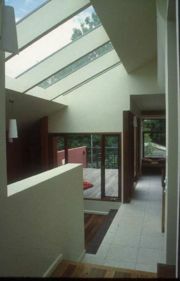 Orienting buildings so that north-facing windows (southern hemisphere) allow sunlight to enter living spaces. Using thermal mass (such as masonry walls and concrete slabs) to regulate internal temperature variations. In the northern hemisphere, south-facing windows get the sunlight. This page was last modified 05:37, 15 March 2011.